Set your anchors at the beginning and end of the transition you would like to edit. This can be done quickly and accurately by clicking on the page tab at the end of the transition. Your anchors will snap to the appropriate page tabs. Go to the Edit menu, choose Lengthen/Shorten Transition. 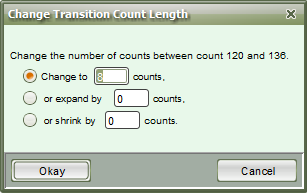 If you know the new count structure (total counts) for the transition, choose the top button, to change to X counts (X being the new count structure you want for the transition). Otherwise, choose to Expand or Shrink (both separate options) by X counts. Once you make your selection and press Okay, 3D will lengthen or shorten the existing transition, depending on the choice you made.